Here are the 5 most annoying new car features as voted by the Torque News staff. Tell us which ones make you crazy. New cars are supposed to make life more enjoyable, not more frustrating. We all love the way some cars do cool things we like. For example, many cars will open all the windows if you press the key fob a certain way. What a great feature as you walk towards a hot car on a summer’s day. Why don’t all cars do that? We here at TN recently wrote a few articles highlighting the best new car features, but now it’s time to let loose! Let’s take a look at look at the worst things automakers and our government regulators have saddled us with – and made us pay for. -	The Seatbelt Chime. This was by far the unanimous winner of our pole. Why do we have to hear the bing – bing – bing, now in ever increasing intensity, as we back our car out of the garage to wash it? We now have cars that can drive themselves, but we cannot figure out a way to suppress a seatbelt warning when wearing a seatbelt makes no sense? Grab your pitchfork and I’ll get a torch. See you at city hall. -	The Nav System Legal Agreement. We all understand that programming a multi-stop route, with varying preferences, into a Nav system, while in an ice storm at night, driving downhill is a bad idea. Got it. Can’t we sign an agreement once, prick a finger and put a bloody fingerprint on the document for authenticity and send it to the attorney general that agrees to whatever the heck those stupid Nav agreements say? 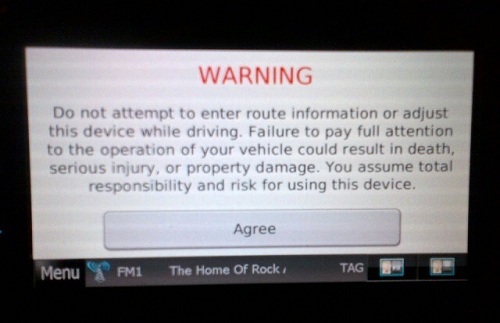 I’ve never read one but I have tapped that damn agreement a brazillion times in hundreds of cars. Enough. We get it. -	Auto High Beam Dimming. – This sounds like a fantastic idea. Why not make a system that puts the high beams on all the time it makes sense, but then dims them when it doesn’t? Good idea in theory, but in practice it DOES NOT WORK. Our staff has tested multiple systems in multiple different brands and they simply cannot stay on enough. Plus, you don’t have the ability to blind oncoming drivers that did not dim their lights. Let’s face it we all like to dole out a little high-bean justice when we drive. -	The Missing Spare Tire. Yes our government wants it all. Light cars that are incredibly safe, use no fuel, and cost $63.00. Now back to reality. We all get flats. If you are the one person who has never had one, go ahead type a comment below – we dare you to test Karma. Telling us that removing the compact spare from a $55,000.00 Cadillac sport ute that weighs 4500 pounds is a way to reduce weight and save gas is an insult to our intelligence. Put the spare back and stop this nonsense. -	Automatic Parking Systems. – This one cuts both ways. Which is more annoying, waiting for the person in front of you to take 10 minutes to try to parallel park, watching as they hit both cars in front and behind the space, then rub the finish off their alloy wheels on the curb, and then give up and gun it back into traffic? Or paying for a system that we feel insulted by in order to say, get a sunroof in an options package? Tough call. This news story is meant to solicit your input. Please tell us the obvious new feature we missed and if you disagree with our choices tell us. We have open minds and want your feedback. "Damn you seat belt chime! Damn you to hell!" Quoth the Heston. Always on headlites. I don't care if they dim to save fuel during the day. And I can turn them on myself for safety in the rain, etc. This is especially obnoxious when you pull into a campground in the middle of the nite or a drive in movie and there's no damn way to turn them off! !